The Blackhawks might have another face to replace on Opening Night. Defenseman Brian Campbell went down under four minutes into the second period of Friday night’s 5-2 win against the Pittsburgh Penguins and required assistance off the ice. It appeared to be a right knee injury. After the game, Campbell was reportedly seen limping in the locker room. 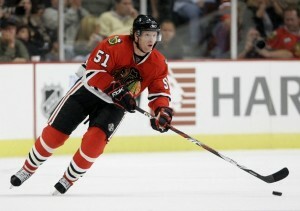 Coach Joel Quenneville indicated that Campbell will be re-evaluated by doctors on Saturday. Any injury that would cost Campbell the beginning of the season could force the Blackhawks to promote super-prospect Nick Leddy, a decision that may have been made without an injury. Quenneville has been high on Leddy’s abilities with the puck since the Blackhawks’ prospect camp in July, and Leddy made it through the latest round of roster cuts on Friday morning.